With all of the construction taking place on Interstate 5, one would think that Stockton was awash in traffic jams. But that’s not the case. On most mornings, I commute south on I-5 to get to work in Downtown Stockton. During this drive, traffic is always free flowing. I only spend about eight minutes total on the highway traveling from Eight Mile Road to Fremont Street. Even with ongoing construction, no shoulders, reduced speed limits and inconvenient traffic patterns, (see the Fremont Street, Highway 4 detour on southbound I-5), congestion is absolutely never an issue. But because regional planners anticipated Stockton homes sprawling into Lodi one day, they thought it prudent to build new lanes. So, here we are. Those 20,000 or so homes on the north side of town still haven’t been built and might not be for some time, but we’re widening I-5 anyways for a price tag of around $485 million. But hindsight is always 20-20. The I-5 project will be completed and we will get some new, shiny lanes, sometime next year. So, what are we getting, exactly, and what benefits will we get for our behemoth of an investment in our highways? 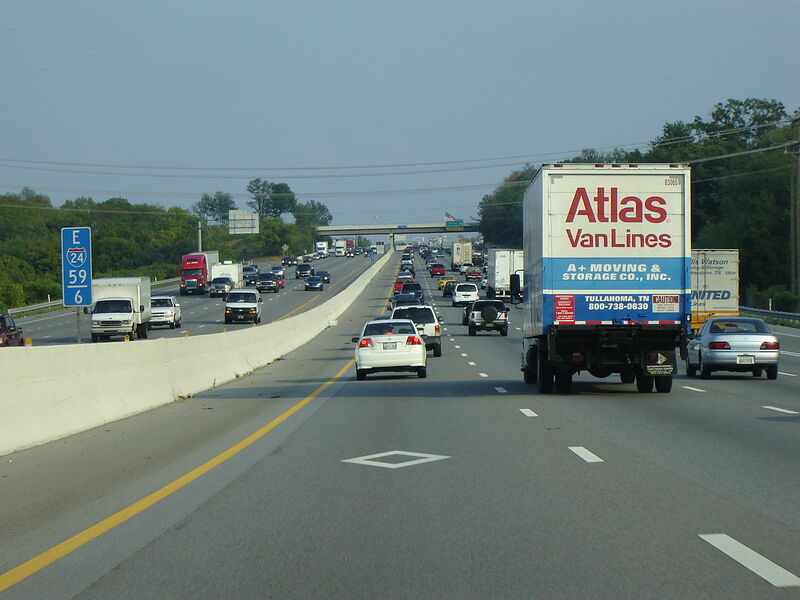 HOV lanes are declining in popularity nationally and aren’t proven to increase carpooling. In the North and South directions, I-5 will be expanded from three to four lanes in each direction. But we aren’t simply adding more capacity; the two new lanes will be High Occupancy Vehicle (HOV) lanes, otherwise known as carpool lanes. This is a first for Stockton, as pretty much any other large metro area already employs these lanes to encourage more commuters to carpool. In theory, this should lead to more carpooling in Stockton. Offering groups of commuters exclusive access to the fast lane should boost carpooling and reduce single-passenger trips, thus reducing congestion and making the air a bit cleaner. The problem is, carpool lanes probably won’t entice many new carpoolers in Stockton for a handful of reasons. First and foremost, there is not much traffic for those commuting within Stockton. The allure of a carpool lane just isn’t there when you never really run into congestion. And if you are commuting to the Bay, you already have access to HOV lanes out there, so you’ve probably already made a choice to carpool or not, and new HOV lanes in Stockton won’t change that. And Stockton will be incredibly late to the HOV lane party. While riding to work with others used to be fairly popular forty years ago, carpooling rates have fallen steadily across the nation. Carpooling is down by nearly 50% since 1980, hovering around 10% of total drivers today. This, despite billions spent across the country in the last 15 years creating more HOV lanes. (Sidenote: On the other hand, public transit usage has been rising—both nationally and locally– for some time now). On top of all that, most HOV lane users aren’t even commuters choosing to carpool together: They are parents using their children to access the carpool lane. One study puts the number of “fampoolers” at 83%. * The goal of carpooling is to take cars off of the road, but no cars are eliminated if these lanes are mostly utilized by mom or dad shuttling a kid to school or soccer practice. To be sure, Stockton does have some congestion issues, but the congestion that we do face is not caused by a lack of lanes; it’s caused by merging. Specifically, merging to I-5 or 99 from Highway 4 during the PM commute. As drivers leave Downtown for the northern or southern parts of the city, they have to merge very cautiously from the Crosstown Freeway to either I-5 or Highway 99. Unfortunately, our new lanes won’t really address this issue since no bottlenecks will be alleviated. A more common sense approach would have been to control the flow of cars entering these roadways from on ramps. It’s not so much that we don’t have enough lanes, it’s that too many drivers are trying to get on to the freeway at once, causing congestion at merging points. A better (and incredibly more cost effective) investment would have been to install ramp meters, those stop lights you see in bigger cities when entering the freeway at periods of heavy traffic. These meters help control the flow of new drivers and are proven to shorten commute times and increase highway speeds. 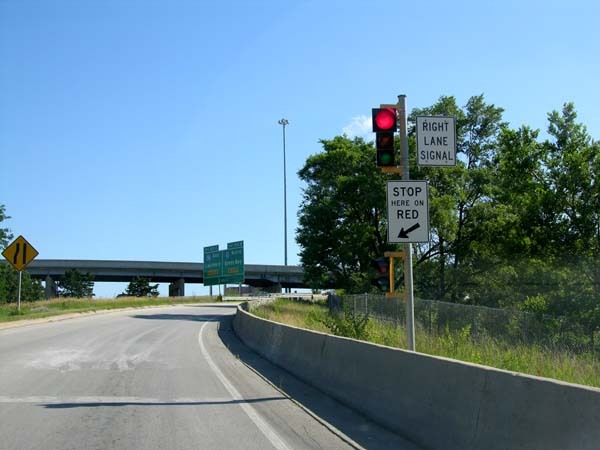 Ramp meters, as shown here, are a cost-effective way to manage the flow of traffic and do not require the construction of new lanes. Here’s a good way to visualize this, courtesy of Tom Vanderbilt’s fantastic and aptly named book, “Traffic.” Consider a heaping scoop of rice, with each grain representing one car. Now try tossing this heap through a funnel all at once. Eventually, all of the rice will pass through, but it takes a bit of time as too many grains fight for a small amount of space. Instead, if you slowly pour the rice down the funnel, the result is a smoother flow of rice, which in turn makes the rice drain faster than when we tossed the whole heap into the funnel at once. This is the exact same way cars work when getting onto a highway. If you can more evenly distribute the number of cars hopping on the highway, those cars will have a much nicer (and quicker) ride. Most big cities use these meters with positive results (though they are not a cure all for congestion). In the Seattle region, a study of meters on Interstate 405 found a time savings of 3 to 16 minutes for drivers depending on the time of day, as well as increasing traffic speeds anywhere from 7 to 20mph. If we could limit the flow of cars entering the Crosstown Freeway during the PM commute, the merge onto Highway 99 or I-5 would not be as bad. Unfortunately, the current $428 million I-5 widening project won’t address this issue. But at least those HOV lanes will make us look like a big city. You’re doing great work, David. You’re a real asset to Stockton and San Joaquin County. On the I-5 widening, there’s more to the project. I-5 was in such bad shape, it was more of an obstacle course than a highway. The primary reason for the work on I-5 is to replace the current roadway with continuous reinforced concrete, which is supposed to last 40 years. When you do a job that’s supposed to last 40 years, you have to think 40 years into the future. The added cost of adding a lane now in anticipation of future growth was seen as much lower than coming back and adding a lane later. San Joaquin COG seems to be building growth into its major capital projects, which I think is prudent, especially when many of these projects are coming in at far below engineer’s estimates. As for HOV lanes, it may very well be that this was the only way to get the new lanes past environmental review. But I would also mention that the current snapshot of traffic on I-5 may be a bit misleading. Stockton is only now recovering from the housing crash of the last decade. The economic downturn had an effect on traffic, which was heavier prior to the crash. You may be right about the utility of HOV lanes here, but we may also be thankful that they were created if things go well economically here. Another example of where future growth was built into a local transportation project is the Eight Mile Road railroad grade separations, which have more room for lanes that aren’t currently striped. Again, it’s often cheaper to build-in anticipated growth at initial construction that to try to retrofit it later. I ask out of legitimate curiosity as someone completely new to area politics: Who is footing the bill for the I-5 expansion? Could this money have even been directed at the proposals you suggest? Thanks for any answers!